Today’s Class 1 was so fun! We could do many fun things together. 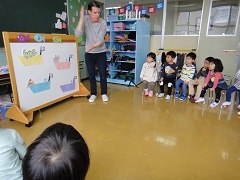 First, we finished our tour of the kindergarten. Yesterday, we toured the basement and saw where the pool and kitchen were. Today, we toured the first floor. We saw lots of intermediate and senior classrooms as well as the office. 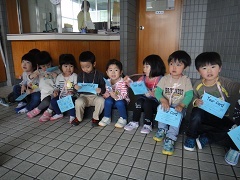 The children could find stickers hidden around the kindergarten too. After our tour, we exercised and had phonics time. The children could help match words to their starting letters. We reviewed A, B, C, and D. The children did so well even though it was a short half day. Excellent job today, Class 1!